I did manage to get back into hiking. To get warmed up, I did a solo ten miler in Rock Creek Park. 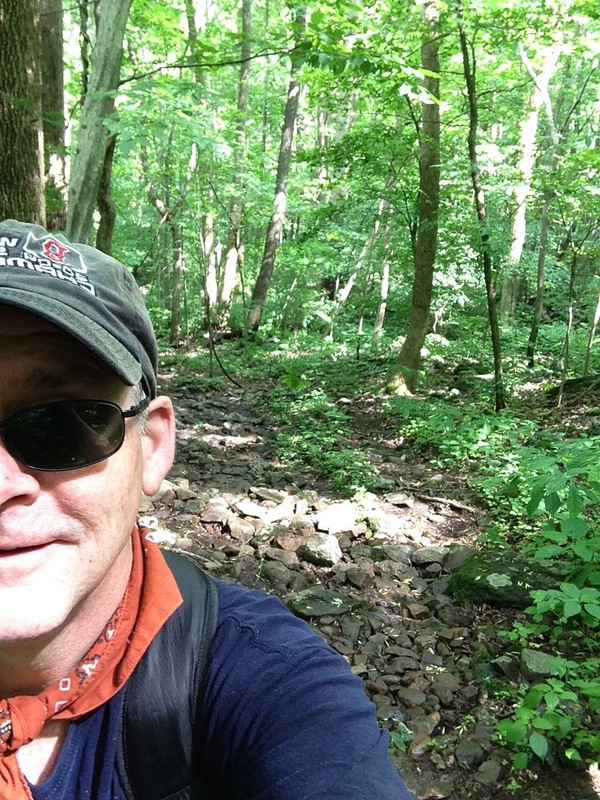 I followed that up with a hilly solo 6 1/2 mile hike in Ashby Hollow on the Appalachian Trail was a challenge. 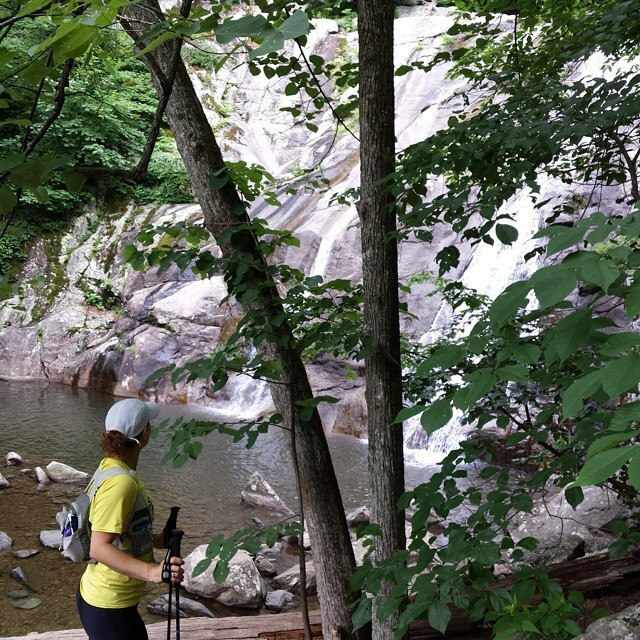 My hike up and down White Oak Canyon with Ultrarunnergirl was my first foray in the Shenandoah National Park. It trashed my legs but the view at Hawksbill was worth it. For the year to date, I’ve ridden 3,791 miles. Eighty three commutes account for 2,533.5 of those miles. I’ve been wearing out The Mule. 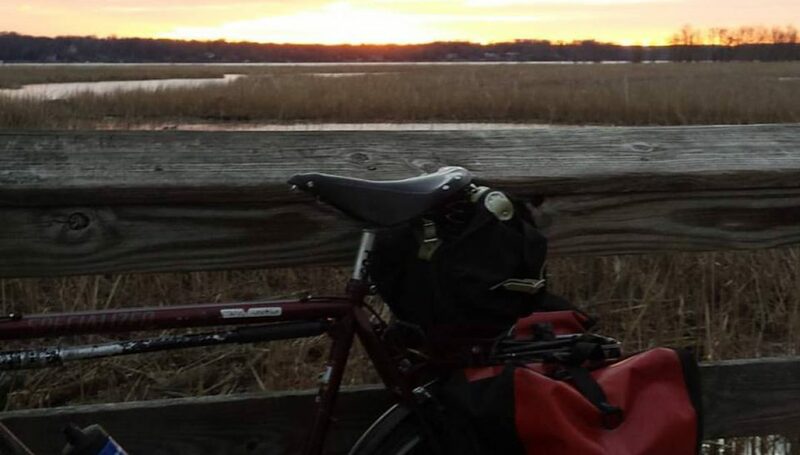 I’ve ridden it 2,304.5 miles including 50 bike commutes. Pretty good for a bike I bought on sale in 1991. Some of you have ridden bikes with me. Some of you have fixed my bike when it was broken. Some of you have waved or said “hello” or just smiled as you rode by. Some of you have organized or volunteered at events that I rode in. Some of you have advocated on my behalf. Some of you made me amazing gifts. Some of you took me to far away lands. Some of you have had a cup of coffee with me. Or split a fritter. Some of you have had a meal with me. Some of you have gone to baseball games with me. Some of you have had a beer or two or four with me. Some of you have hung out in the park with me. Some of you have gone on hikes with me. Some of you have counseled me when I was depressed. Some of you have told me intensely personal things (in confidence where they remain). Some of you have opened my mind. Some of you have made me laugh. Some of you I haven’t seen in far too long. Some of you have said, “Goodbye.”. Some of you have given me a hug. Some of you have even read this silly blog of mine from time to time. All of me thanks you. Yesterday it rained and rained and rained. It flooded and flooded and flooded. Today the weather was nearly perfect for bike riding so I went for a ride in Montgomery County MD with Science Mom. This is not her real name. She is keeping a low social media profile these days. If I told you why, I’d have to kill you. She is in the Bicyclist Protection Program. We started our ride in Poolesvill and rode clockewise around Sugarloaf which is about ten miles to the north. The roads are really splendid for bike riding. Today, however, they were littered with stones, tree debris, and mud from yesterday’s floods. We chatted as we rolled along, Science Mom on her commuter hybrid, me on Little Nellie, my Bike Friday New World Tourist. Science Mom hasn’t done any riding except for her five mile commute so the plan was to take it easy and tweak our route based on how she was feeling. We arrived at the entrance to Sugarloaf, assessed our comfort level, and decided to ride around the mountain on Comus Rd. As it turns out, Comus Road is unpaved to the west of Sugarloaf and paved to the east. We headed west. The storms of yesterday made for some sketchy riding. The road had a pronounced crown on it. Little Nellie’s wee wheels were making a go of it. Until we came to a ditch across the road. This looked like a drainage channel that had been enlarged by run off from the storm. I had to come to a fast stop else Little Nellie’s front wheel would have been eaten by the ditch and I’d have been launched over the handlebars. Then I heard Science Mom, “Whoa. Whoa. Oh no!” I turned expecting her to rear end me. She had come to a stop about ten feet behind me but her clipless pedals would not disengage from her feet. Over she went to her right. The crown of the road added to the distance she fell. 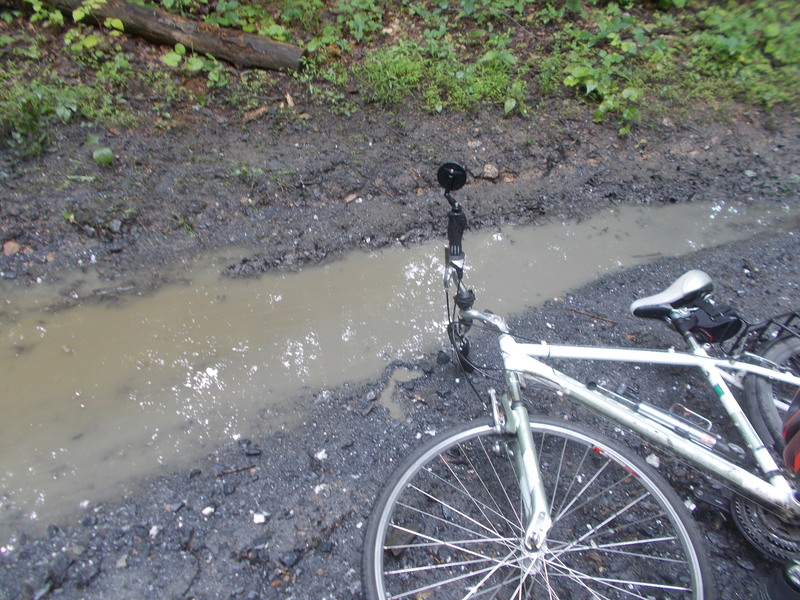 The huge mud puddle on the road’s edge made for a rather comical splashdown. “Should I take a picture?” I asked tongue firmly in cheek. After I had my laugh I took off her left sandal which allowed her to stand up. Neither foot unclipped which may have been a good thing. 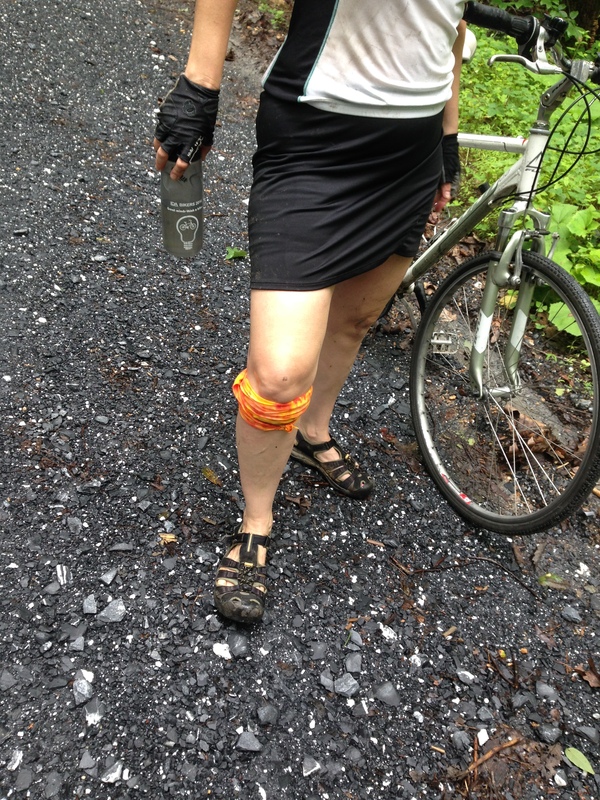 She had a boo boo on her right knee and a wet jersey but otherwise she had survived the crash swimmingly (sorry). She wrapped her knee in a bandana and got her shoes back on. A silver minivan approached from the far side of the trench. I warned them to slow down. They made it across the trench and stopped. In the shotgun seat sat Mathilde, a friend from Friday Coffee Club, on her way to a hiking outing on Sugarloaf. We had a nice chat and gave her directions to the parking areas on the mountain. Ou est Sugarloaf, si vous plait? Back underway we took it easy but the road didn’t. Hill after hill. None of them particularly brutal but not the kind of thing you want to be dealing with after whacking your knee on the ground. Science Mom plugged along. We finally found a paved road and headed north. We were expecting sunny skies which would have really enhanced the already splendid views. The overcast kept the temperatures down. This was a blessing as the roads back south were hillier. We especially liked the aptly named Peach Tree Road, a windy, shaded, hilly, rural masterpiece. I think I messed up a couple of turns but it didn’t matter. All the roads in this area are bike heaven, which explains why we saw dozens of bike riders enjoying the day. Even with a sore back, riding today was effortless. I was in cruise control for all but a few of the hills. On the drive back we took the scenic route along River Road. Or we tried to. 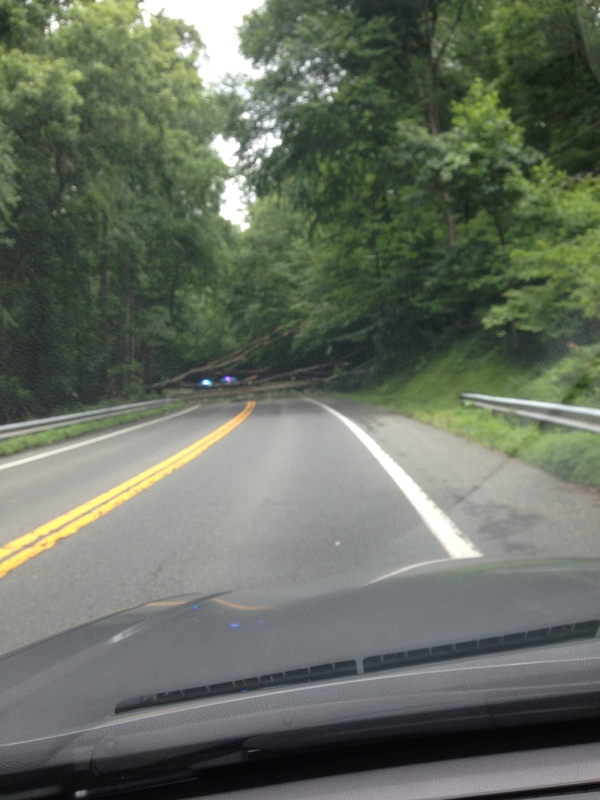 The rains had so soaked the ground that we saw trees toppled over all over the place. The last one was right across River Road. Good thing nobody was under it. Despite her crash, Science Mom was pretty happy with how the day turned out. She doesn’t get to do this sort of thing very often. Little Nellie was happy too. She turned 15 during the ride. It’s raining in DC. 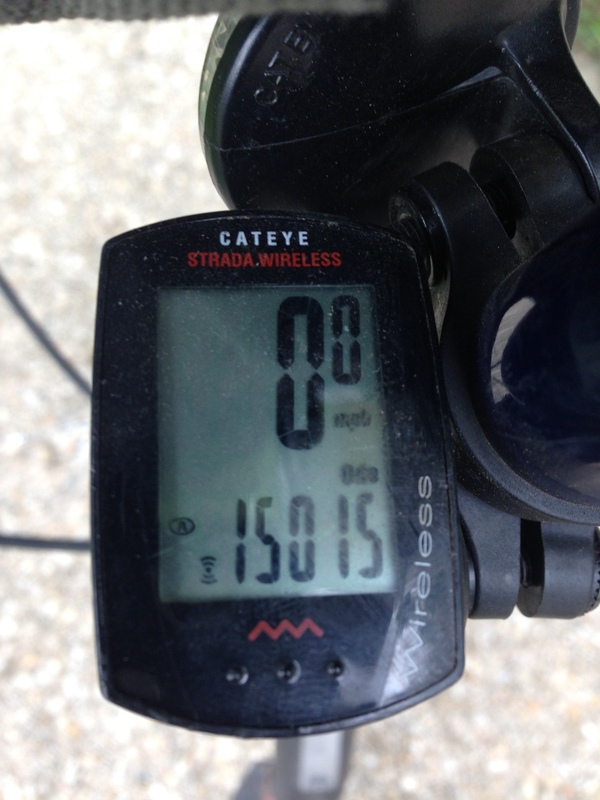 I have had a pretty good week of four bike commutes (and one telework day). Riding today isn’t going to happen. So I will spend my day scanning old slides into jpeg format. So far I haven’t found any with me and my childhood bikes. Apparently, I was a skeptical boy in those days. I did, however, have awesome jammies. I’m spending the rest of the day scanning some more photos. The results are on my Flickr page. Yellow band in the present moment. White roses and a smile. Well, I don’t know about dark but yesterday’s evening rush hour was Lena Horne stormy. Hail. Thunder. Lightning. Wind. Torrents of rain. Just the thing for breaking in (or, perhaps breaking) a new bike commuter. So my co-worker Kelly set out to beat the storm. She has a 40 minute commute and was determined to beat this storm as she had beat the previous two evening storms. She found herself seeking shelter under I-395 just north of Shirlington. Good idea. Yay, Kelly. Alas, here is where Four Mile Run is pinched by the underpass and the Four Mile Run trail. The creek had become a rage of white water. The waters began to rise over the artificial banks. Kelly found herself standing in eight inches of water. After a few minutes of terror, she rode home. the storm had passed. The waters receded. After recovering her sanity and walking her faithful canine Paddington, she went back out and rode to the bike commuters’ Third Thursday Happy Hour in Shirlington. Our end of a very long set of tables filled with bike commuters included Ed and Erin. I have been reading Erin;s blog for a while and looked forward to meeting her. It turns out she’s yet another member of the Rootchopper Prosopamnesia Club. We met on the Mount Vernon Trail last summer. I only began to connect her to the meeting after hearing her speak. After happiness was achieved, Kelly went right and Ed, Erin, and I went left. I led the three of us over the hills in Alexandria. In Del Ray Erin veered off for home. Ed and I took my supersecret route through Old Town. South of the beltway, we took Fort Hunt Road and Sherwood Hall Lane instead of the MVT, because nothing makes beer in your belly feel quite as awful as some bicycle hill climbing. I woke up extra early (my beer and black bean burger wanted nothing to do with a full night’s sleep) and rode to Friday Coffee Club with surprising spring in my legs. Now if only I can get home without killing my legs so I can go on that hike tomorrow with Ultrarunnergirl. White Oak Canyon, here we come!. I have been a sloven blogger. Monday’s ride to work featured a five minute conversation with Ellen, a bike rider whom I have never seen before. She was admiring my Bike Friday. I will likely never see her again. Such is the impermanence of the social life of the moving cyclist. Tuesday was a great day to ride to work. So I worked from home. Instead of doing a short bike ride in the evening I mowed my lawn. 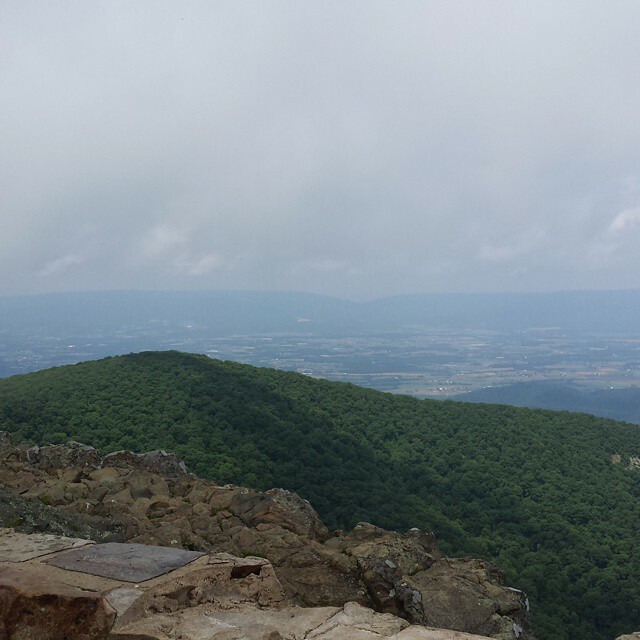 This frees up Saturday so I can go for a hike in Shenandoah National Park with Ultrarunnergirl. Woot! Yesterday’s bike commute came in three stages. It was like the Tour de France only not so much. The ride to work was uneventful. I was hoping a random passing cyclists would admire my legs and chat me up, but, as is always the case, this didn’t happen. Stage two was an evening ride from the office to Smith Public Trust in the Brookland neighborhood of DC. This ride took me across town at rush hour. I managed to improvised a route that made it a breeze. I took the Mount Vernon Trail to the 14th Street Bridge. (Along the way I passed the snow goose which I am now convinced is a swan.) From there I rode into Southwest DC. Up 7th Street all the was to K Street NW. Then K to the Metropolitan Branch Trail which dropped me off about a mile from the pub. There was a happy hour to wish Shane Farthing a fare thee well as he moves on from his position as the Managing Director of the Washington Area Bicyclists Association. There were many #bikedc people. I met many #bikedc people. There were nachos. There was beer. I stayed way too long. I headed for home at around 9:30. Thankfully, Dave Salovesh escorted me down the MBT. I was riding Little Nellie which has little wheels. Little wheels are fun to ride because they are twitchy.Twitchy is not a good thing when you’ve been drinking. (Biking is not a good thing when you’ve been drinking. The Brookland transporter pod was broken leaving me little choice.) I was also using clipless pedals for the third time since March. I nearly killed myself trying to negotiate a sharp left turn on the trail. I tried to unclip to put my foot down but the shoe wouldn’t disengage. I rode off the trail, luckily into some grass. No fatality, no foul. Dave took me to the new 1st Street NW cycletrack. It is fantastic. There is a concrete berm, a physical separation between the main lane and the cycletrack. Wonderful. Dave headed to Salovesh Estates on Capitol Hill. I headed west on the mall then took my usual route home on the Mount Vernon Trail. It was raining lightly. My head was clearing from the beer. Now I was just dead tired. Only 14 miles to go. Watch out for that fox! Watch out for that rabbit! Watch out for that deer! And here I was worried about cars in the city. The damned wildlife nearly got me. I made it home around midnight. After six hours of sleep, I rode to work today. By way of the Third Thursday Happy Hour in Shirlington. From all the recent bad news coming out of Baltimore these days, you’d think the city was going to change its name to Baltiless. Days like today belie the news reports. Sure Baltimore still has plenty of problems, but it has so much going for it. 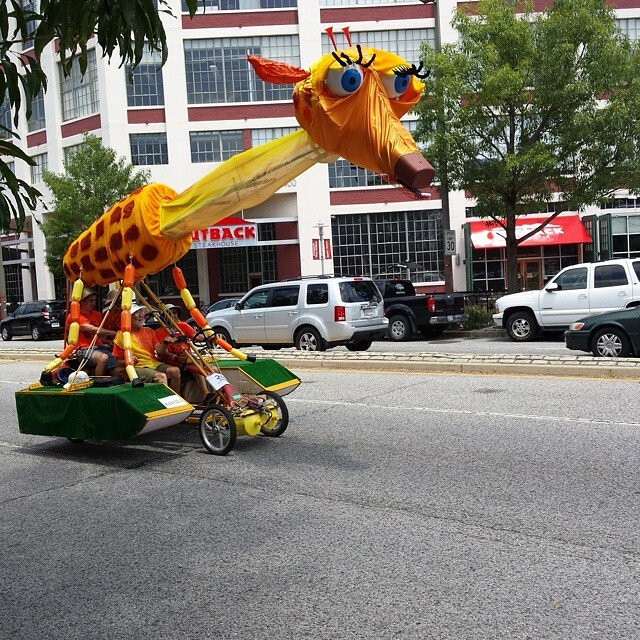 I had thought about driving up for the annual Kinetic Sculpture Race which my friend Charmiane has raved about. There was also a well regarded bike ride called the Tour Dem Parks. And an Orioles game. And a celebration of the Hampden neighborhood. Baltimore was feeling its oats today. After doing my physical therapy and reading the paper I had dithered away too much time to do the Parks ride. My friend Linel had managed to dither less and made it to the ride. (I’m jealous.) I still wanted to see the race so I hopped in the Millenium Falcon and drove north. If I had my act together I would have tossed Little Nellie in the trunk of the car, but the prospect of walking aronud in bike shoes put me off. I regretted my decision. Parking in downtown Baltimore on a Sunday is a tad pricey, $30 for the day. 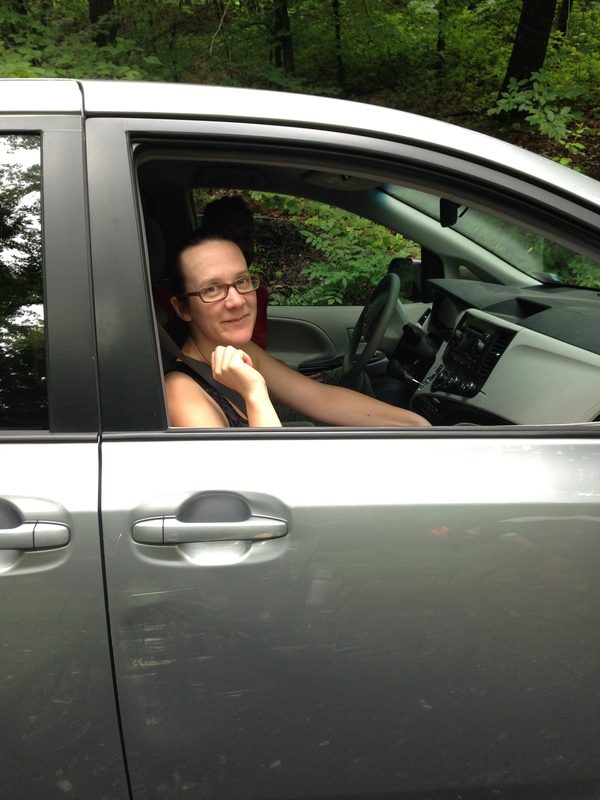 I drove to Patterson Park and parked for free on the street. I was now more than a mile from the Race, Fells Point or anything else I wanted to see. Dumb. Bikes are good. Folding bikes are gooder. 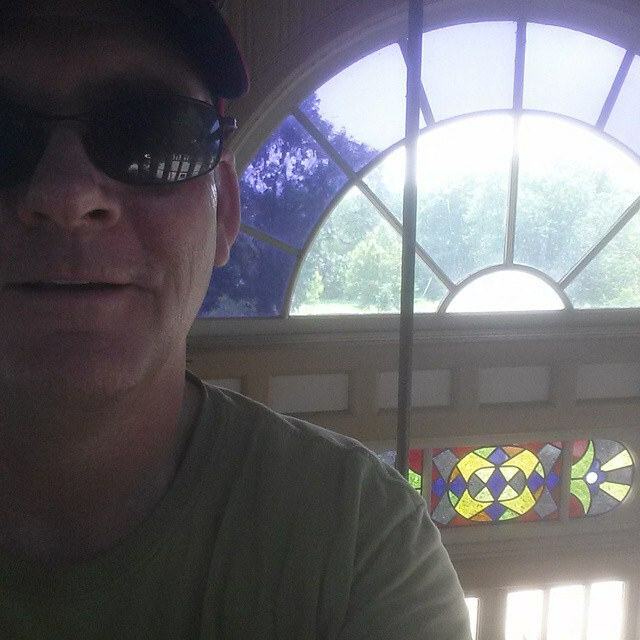 I walked into the park and my favorite Baltimore building, the Patterson Park Pagoda was open. I climbed the stairs to the top and enjoyed the fantastic 360 degree view of the city and a cooling breeze. I stayed up there a good 20 minutes watching the Parks riders climb the hill to the 25-mile rest stop at the base of the Pagoda. I was using Instagram and I noticed that Paris, whom I had met at the Cookie Ride earlier this year, had just taken a selfie with the Pagoda in the background. I climbed down and found her. We talked for a few minutes and she headed out for ten hot, muggy miles of bike riding. I hoofed it to the Canton neighborhood to check out the race. People were all headed east on Boston Street, the main drag in Canton. I didn’t see any race so I left the street for the much prettier waterfront promenade. I don’t do boats but it would be sweet to live along the water here. After 10 minutes I spotted on of the race participants heading east on Boston so I went back to Boston to check it out. The “sculptures” came in ones and twos. They are really sculptures they are more like human powered parade floats. As I watched I was tweeting my friend John Roche who was coming to what he referred to as the splash zone. It turns out the sculptures also have to go into the water and sail (if that’s the word) around a buoy. Yes, they were parade floats in every sense of the word. Huge dogs (one with a sock monkey on its back), a black birthday cake, a dinosaur, a space shuttle, a giraffe. The designs were whimsical and creative. The crowds watching the floats floating were festive. It was hard to see the actual action because the crowds were several people deep. Everybody was in a good mood, including John and his wife Kate. Kate is pregnant and overdue. Despite the heat and being on her feet for what must have been over an hour, she looked fantastic and was in a great mood. Kate wasn’t alone. I saw half a dozen pregnant women in attendance. And one mom with a brand new baby. What’s in the water, hon? I left the splash zone with John and Kate. They headed home and I hoofed it back to my car through a neighborhood of row houses. Many of these row houses were three stories tall with roof top decks for views of the water. It just looks like the kind of place that would be a blast to live in. And these homes are only a short walk or bike ride from downtown. I know it has its problems, but from what I can see, Baltimore is looking good. Except for the Orioles, of course. Paris’s account of the day is here. A few more pix of the race here. I had every intention of doing a lot of hiking this spring and summer but, well, you know. So last weekend I kicked off my hiking year with a 10 miler in Rock Creek Park. This was way more than I should have done, but it was fun. I even got a little lost – which is something I am good at. Today I woke up early and drove to the western facing side of the Mount Weather in the Blue Ridge Mountains. After some interesting driving on windy roads, one of which was unpaved, I found the unmarked trailhead. It’s just a point on the Appalachian Trail that crosses this dirt road. I was expecting a sign. Good thing the directions I got from Hikingupward.com were spot on or I’d still be driving around up there. After smearing myself with sunscreen and big spray, I headed into the woods on the trail. Ahhhh. I was instantly transported back to my childhood when I spent hours and hours in the woods near my home in Albany. In my mind I was in the wilderness but I was never more than a mile from home. This, however, was mighty close to wilderness. It was silent. The canopy of leaves provided relief from the summer sun. All I could hear was the sound of my footfalls, the leaves blowing in the the breeze, the birds calling., and the sound of my breathing. The first half mile was downhill, sometimes straight, sometimes meandering through chicanes. The footting was fine. There were plenty of rocks and tree roots to force me to focus on the ground in front of me. As I made my way, I suddenly realized this is the goddamned Appalachian Trail! This section of the AT is called the Roller Coaster, which perfectly describes the terrain: down, up, and around. After a half mile, I came to a bridge across a stream at the base of the hill. On the other side the trail rose for 0.9 miles to a ridge. I realized: nobody’s here! Solitude. This ended in a few minutes. I came upon a through hiker. He had a big pack on his back and looked like he’d been in the woods for a long time. A few minutes later a trail runner came bounding past. How the hell do you run on this terrain, in this heat and humidity, with all these rocks and roots on the trail? He was smiling. Go dude! The trail reaches the ridge then drops through a saddle to another stream. This one had no bridge, just a mess of rocks to play hopscotch on. After this stream I missed a turn (I never did find the blaze) and hiked up a fire road. I didn’t realize my mistake until the road came to a T with no blazes in either direction. I took the Robert Frost route until the foliage overtook the road. Oops. Turn around. Not wanting to hike back down the hill to the last blaze, I took the anti-Robert Frost route. The fire road intersected the trail and I was back in business. Going up to another ridge. This one has splendid views of the Shenandoah Valley during the winter but for now I would have to be content with a sea of green. The trail instructions that I downloaded said to keep hiking until I came upon a “rocky are with views of the west.” Without the views to the west it was kind of hard to tell when to stop. So, of course, I didn’t. Did I mention it was hot and humid? I was soaked in sweat. I was wearing a knapsack containing six water bottles. I felt like and inverse Jacques Cousteau. I kept going until the trail turned downhill. At this point I figured I must be past the turnaround point. So I turned around. I celebrated by eating some crackers and pop tarts as I headed back. If anyone had come along the conversation would have gone something like this. The way back seemed much faster at first. Of course, I was going downhill at first. I was looking down at the trail to make sure I didn’t turn an ankle on the rocks when I saw it. A tan colored snake right where my foot was about to go. I don’t know much about snakes but he didn’t have a rattle so I figured he was harmless. I picked it up and licked it. Just kidding. I gave it a wide berth. I don’t like snakes. On the way down the hill I saw where I had made my mistake. There was actually a sign saying AT North but no corresponding sign saying AT South. I passed another overnight hiker, this time a woman in her late 20s or early 30s. (For all I know she could have been 40.) She looked like she had just started, but had been hiking for a least an hour. Tough girl. I reached the bottom of a hill and headed back up. I could hear the sound of boys making a lot of noise. So much for solittude. I reached a ridge and there were the boys splayed out on a wide spot on the trail. They were junior high age, doing an overnight hike with a couple of dads keeping them out of trouble. They quieted down as I worked my way through their supine bodies. Enjoy the bugs and dirt, kids. I kept on keeping on with the sound of my feet for company. I pulled up when I saw a huge black snake. Dang. There must be a whole lot of snake food in these hills. On my way back up the last 1/2 mile to the car, I passed a through hiker resting. His shirt was off, hanging on a tree branch. His stuff was spread all about. “Gotta take a break in this heat,” he said as I plodded past. No kidding, dude. The last bit up to the car was the steepest part of the hike. This was not unlike my Sugarloaf hike. Suddenly, I emerged from the woods and there were the cars. When I parked there was only one car, now there were eight. I was totally soaked. And it felt wonderful. After the Sugarloaf hike, I thought that hiking is better with other people. Not anymore. This solo hike was like a mental massage. My mind was completely relaxed as I took my pack off. There will be more hikes. Many, many more. Some solo. Some with friends. Wanna go?